A proper Finnish parade belt. A very patriotic design, with an aluminium lion buckle, made of white & blue fabric. The clasp and adjustment is a traditional German type: the belt and a separate adjustment strap is pushed through the buckle, then the prongs are used to set the buckle to a suitable setting. The belt is about 5 cm wide. The actual sizes are 5 cm shorter than the army markings, i.e. 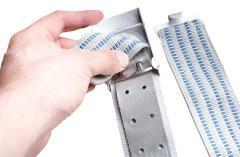 a "size 100" belt is only 95 cm long. The belt can be adjusted about 10 cm downwards from the actual size. The cause of this is probably good old military bureaucracy, which, at least in Finland, is traditionally performed by barely-literate and uneducated "officers". Some used, all in good serviceable condition.